给winpe添加explorer教程(下):explorer的完善设置与其他讨论 « 永远的wing - wing's forever, wing's my love. 6.1.3 这是唯一需要文件修改与添加的地方. 参见 http://bbs.wuyou.com/viewthread.php?tid=167092 用hex编辑器打开winlogo.exe,查找4D0069006E0069004E005400 最后两位改为01即可. 下载ux.exe,在运行explorer前运行此小程序即可. 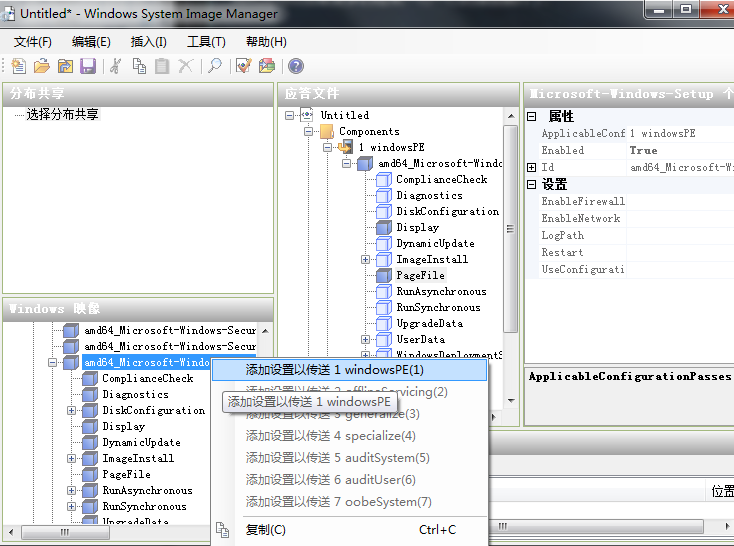 6.2.3 找到你正在运行的win7注册表 HKEY_CURRENT_USER\Software\Microsoft\Windows\CurrentVersion\Explorer 下,导出 Advanced,Personalization和HideDesktopIcons备用;导出HKEY_CURRENT_USER\Software\Microsoft\Windows\DWM 备用. 8.1.1 比如要加入ie8,就复制Program Files\Internet Explorer下所有文件(以及system32文件夹下相关文件)到D:\TEMP\winpe3.1\org\mount\Program Files下即可.注意这是64位ie,你要愿意,也可以Program Files(x86)下的32位ie. 如果文件不大,可以直接放到program files 目录下并和wim文件一起打包.你也可以单列出来放到光盘上,或是打包成新的wim文件,进入pe后再挂载.桌面快捷方式在\Users\Default\Desktop .锁定到任务栏快捷方式在\Users\Default\AppData\Roaming\Microsoft\Internet Explorer\Quick Launch\User Pinned\TaskBar, 另外还需要导入default单元的 \Software\Microsoft\Windows\CurrentVersion\Explorer\Taskband 项. 这个已经讨论很多了,分离式和盘就不说了 http://www.wingwy.com/?tag=%e5%a4%9a%e5%90%88%e4%b8%80%e5%ae%89%e8%a3%85%e7%9b%98 ,网上的和盘模板也很多.其实我们可以整合到安装盘的source\boot.wim文件中,此文件分两段,一段pe,一段setup(注意一个wim文件只能有一个/boot的单元启动).整合后可以更省空间.另外,32位和64位win7可以放到一起,还可以加入2008,xp等,具体可以参考我在vista早期的文章,http://www.wingwy.com/archives/2008_07_139.html .原理类似, 直接操作install.wim文件就可以了,这个方法理论上可以安装32位和64位的xp,vista,win7和2008(R2). 这是唯一需要文件修改与添加的地方. 参见 http://bbs.wuyou.com/viewthread.php?tid=167092 用hex编辑器打开winlogo.exe,查找4D0069006E0069004E005400 最后两位改为01即可. 下载ux.exe,在运行explorer前运行此小程序即可.